Negotiators on a 20-year, 1,200 megawatt clean energy contract for Massachusetts want more time to finalize the agreement with a Maine project due to severe winter weather and changing proposals. Massachusetts energy officials originally chose the Northern Pass Transmission project with Hydro-Quebec power for the project, but when the New Hampshire Site Evaluation Committee denied its application Feb. 1, they turned to the Central Maine Power’s New England Clean Energy Connect project, which also includes Hydro-Quebec power. Negotiations between CMP and Massachusetts electric distributors were to be finalized and presented to the Massachusetts Department of Public Utilities April 25 under a timeline for the clean energy project. But the distribution companies wrote the DPU Wednesday saying they need more time. Negotiators said three powerful nor’easters hit the region at the beginning of March and key members of the selection team had to respond to the situation including the restoration of power and beyond. “As a result, the work of the Evaluation Team was severely impacted, resulting in cancelled meetings, delayed document reviews, the absence of key technical personnel and decision-makers, and related issues,” according to the letter from attorneys representing the distribution companies, Eversource, National Grid and Unitil. They also said the New Hampshire Site Evaluation Committee’s decision caused a delay when another project was eventually chosen to go forward and negotiate with the distributors. “The above process took considerable time and attention from the Evaluation Team, essentially extending the Section 83D selection process by three weeks beyond the originally anticipated schedule,” the attorneys wrote. They said despite the delays, the distribution companies and NECEC are in the final stages of negotiations. The transmission project is currently before the Maine Public Utilities Commission seeking a Certificate of Public Convenience and Necessity to construct the 145-mile, above-ground transmission line, at a cost of $950 million. Two-thirds of the line is along a right-of-way controlled by Central Maine Power, with about 50 miles through what has been described as virgin forest. The project moved through the Maine regulatory process fairly quickly until CMP was awarded the Mass. Clean Energy bid. Since that time a number of groups, including electric generators, other utilities and environmentalists have asked to intervene in the proceedings and have been approved but cannot revisit issues already settled in the docket. Torgerson said the company hopes to have the Maine certificate by the end of the year, and final Massachusetts DPU approval next year. Construction would begin in 2019 and be completed in 2022. he told investors. 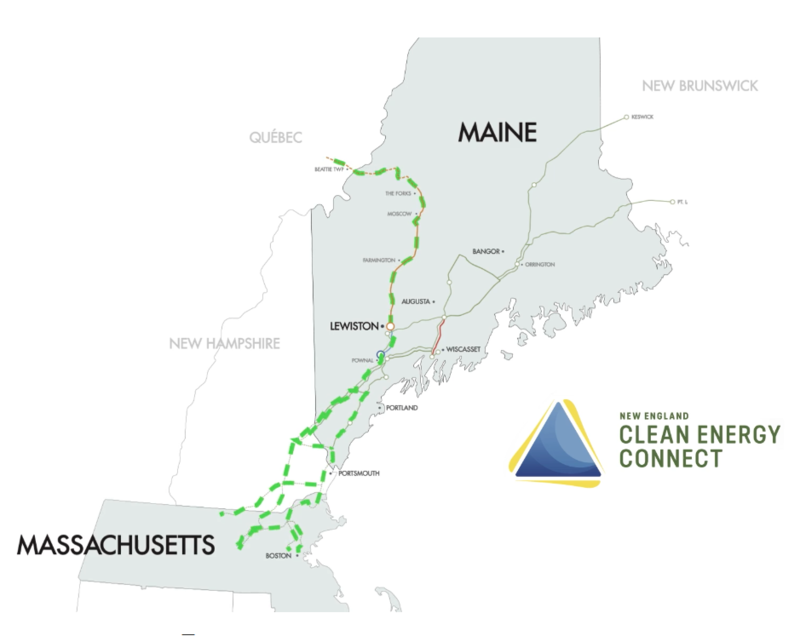 One of the key reasons Northern Pass was selected for the Mass Clean Energy project was the company claimed it would be completed by 2020. Despite the setback, Northern Pass continues to push for New Hampshire regulators to revisit their decision to deny the application. Project officials have until April 30 to ask the Site Evaluation Committee to reconsider its decision, which they said they will do. After Northern Pass files its motion for reconsideration, intervenors and the Counsel for the Public have 10 business days to respond. The Site Evaluation Committee scheduled deliberations on the reconsideration motion May 24 and June 4 if necessary. If the SEC denies the motion to reconsider the project, Eversource has said it would appeal the decision to the state Supreme Court, a process that would take about a year.